I would like to report that the multi-monitor support is very broken in Lion, specifically with full-screen apps. Full-screen apps are great, it’s nice to have an immersive view of content, however the user needs to be able to choose which display the full-screen app appears on. On my MacBook Pro, I like to keep the built-in display as primary, but sometimes would like to have Quicktime or iPhoto full screen on the external display. In Snow Leopard, this was possible, however in Lion there is no way to make apps full screen on the external display. Another problem is that making any one app full screen makes all other connected displays useless. My Mac Pro has 3 displays connected. Lion makes it impossible to say, watch a video in Quicktime full-screen on one monitor while simultaneously checking mail or browsing the Web on another. I’ll admit, there is a solution to this problem: not using any Apple apps. VLC is able to go full screen on one monitor with Firefox full screen on another and leaving my other display available for use. Apple, please fix this, or this Mac Pro will be my last, and it will be running Snow Leopard for the rest of its lifetime. This is a message for the commenter “WC from Bristow” who posted a review of Mac OS X Snow Leopard on the Apple Store website on Decemer 11, 2010 (review posted below for SEO/reference). I just wanted to let you know that your MacBook Pro is DEFECTIVE. I hope that by some strange chance you might read this before your warranty expires. There is a known issue with the GeForce 9400M graphics chips in the original unibody MacBooks with removable battery. There is random screen flickering. This is a hardware issue, and no matter what you do will not go away. If your laptop is still under warranty, and even if it’s not, take it back to Apple and demand a replacement. They will probably swap it for a new, current-generation MacBook. Just a friendly suggestion from someone who went through the same frustration. Snow Leopard brought some serious problems. Mail will chew up 50 to 75% of the processor just idling. Flashing video/screen on MacBook Pro 15″ when on low power video card setting causes me to run all the time in high performance mode so it does not flash… and now my battery lasts for an hour and a half if I am lucky. (in part because of the processor overloading of Mail). This adds 2 lbs+ to the laptop because I must now carry two extra batteries (and I do). Hope that Lion brings some relief. Snow Leopard has fleas. It seems the owner of the root somehow gets messed up, probably after Chameleon install (just a wild guess). Update: For anyone who is having problems, I have a new kext package. This is a zip of my /Extra folder that I’m using right now on my Inspiron 640m. 640mExtra-Updated Also my system is 32-bit only, so I can’t guarantee this will work in 64-bit mode. After much trial and error, I finally found the proper procedure for installing Snow Leopard onto my Inspiron 640m. For reasons that I cannot fathom, I was unable to perform the chameleon cdboot/swap to boot from the retail Snow DVD. It might be my DVD drive, or some other cause, but I didn’t bother finding out; I just took the hard drive out of my laptop and connected it via USB to my iMac. Remove hard drive from the Inspiron. Connect it using a hard drive dock or USB to SATA enclosure/adapter. Put Mac OS X Snow Leopard DVD into existing Mac (Hackintosh or real mac, doesn’t matter). Using Disk Utility, partition your Inspiron’s drive as you like, using a GUID Parition table. With your Snow Leopard DVD mounted, in Finder, choose Go to folder. In the box that comes up type “/Volumes/Mac OS X Install DVD/System/Installation/Packages”. This will open a folder with a lot of install pkgs. Find OSInstall.mpkg and double-click it. Follow the steps to install Snow Leopard, making sure to pick the proper drive for installation. Once the installation is done, eject your USB drive and put the hard drive back in your Inspiron. Download the Inspiron6400.iso and burn it to a CD. From the Chameleon menu, use the arrow keys to select the hard drive. Your Inspiron should boot into Snow Leopard. Congratulations! In the Inspiron640mExtensions, you will find kext helper. Run it, and drag AppleBCM440XEthernet.kext, VoodooBattery.kext and VoodooHDA.kext onto it, enter password and install. You will also find the Chameleon RC4 installer. Run it, but DON’T reboot at the end. Extract the Inspiron640mExtra.zip. Copy the contents of the extracted Extra folder to /Extra. Remove the Inspiron6400 CD and reboot. hopefully your laptop should boot fine from the hard drive. I cannot get the laptop to wake from sleep. As such, the SleepEnabler.kext is not included. I also included the InsomniaX app which you might choose to install to prevent your laptop from sleeping. This method seems to be update-safe. I just updated to 10.6.2 using Software Update and all is ok. When the clamshell display is closed, the Dell BIOS or something blanks the screen. Mac OS cannot re-enable the screen and you’ll be stuck staring at a black LCD. To circumvent this, set one of your screen corners in Expose prefs to put the display to sleep. If ever you find yourself with a black screen, move the cursor to that corner to force the display to sleep, then wake it up again. The Intel PRO 3945 ABG wireless card that came with my Inspiron (and all Inspirons that are branded “Centrino”) does NOT work with Mac OS X. I swapped mine for a Dell 1505 Draft-N card (cheap on eBay) that works perfectly out-of-the-box. The Broadcom 440x ethernet card seems to work fine, I tested it briefly with some light web browsing. However, the original thread says that the driver occasionally drops connections, so YMMV. Finally, a quick thanks to all the OSX86 devs. None of the kexts found here are made by me, all credit goes to the original authors. I found all the necessary info over at the InsanelyMac forum. Update 4: Please see updated post. Update 3: I recently tried to format and re-install snow leopard, and now I can’t get the laptop to boot from the Chameleon cdboot. I’m working on it and will post when I find a solution. Update 2: The Broadcom 440x kext found here makes the card detected in Snow Leopard, however, it works intermittently. Most of the time you will fail to get an IP. Update: You can run updates from Software Update, however remember to DELETE SleepEnabler.kext before upgrading to 10.6.2 (check /Extra and /System/Library/Extensions). Otherwise you’ll get a nice kernel panic. Just installed Mac OS X 10.6 on my trusty old Dell Inspiron 640m. It was quite easy; actually easier than Leopard. Then, I installed a few additional kexts for the onboard Broadcom 440x (AppleBCM440XEthernet.kext), battery status display VoodooBattery.kext, and HD Audio VoodooHDA.kext. I have only one problem with this setup, the laptop does NOT wake from sleep. It’s been a week now and I still have had no success installing all 3 major OSes on my MBP. OSX+Windows works fine (via Bootcamp), OSX+Ubuntu 9.10 also (9.04 hangs on boot). After much hacking at the command line and Google, I found this handy little app that strips the ACLs from files or folders. Why would I want to do this? Well one example is when attempting to retake ownership of a home folder recovered from another Mac’s hard drive. Mise à jour: Ce clavier fonctionne toujours sous OS X 10.9 Mavericks. Il se trouve dans la catégorie “Autres” des méthodes de saisie. 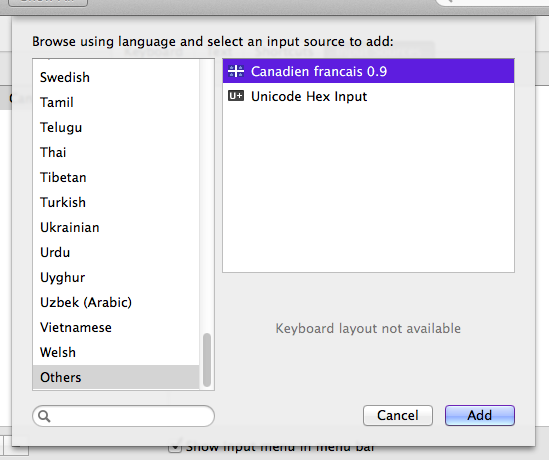 Update: This keyboard layout still works with OS X 10.9 Mavericks. You can find it in the “Others” category of keyboard layouts. I have also put it on github. This used to be on my googlepages page, but apparently that’s going to be shut down, so here it is now. Download, unzip and stick the two files (cf.icns and cf.keylayout) in /Library/Keyboard Layouts. 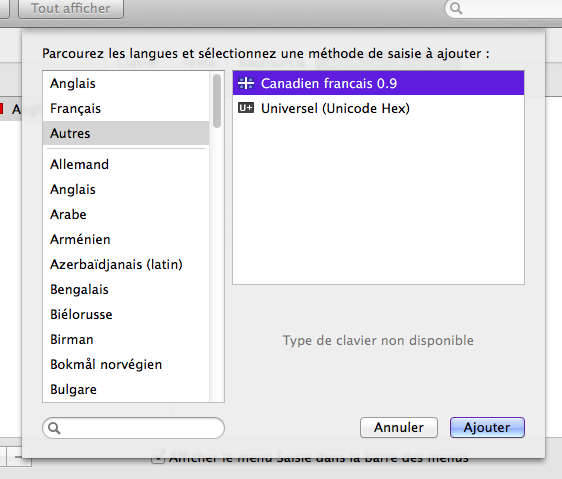 Then go to System Prefs, International (Language and Text for Snow users), Input Menu and check off “Canadien Francais 0.9”. (You may need to log out and back in before the new layout appears in System Preferences). I did NOT make this keyboard layout, I found it somewhere on the web but the original site is now gone. 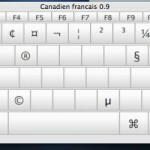 Voici le clavier Canadien francais pour Mac OS X. C’est l’équivalent du clavier “Canadian French” ou Français (Canada) sous Windows. Pour installer, télécharger le fichier .zip depuis github, décompresser, et copier les deux fichiers (cf.icns et cf.keylayout) dans le dossier /Library/Keyboard Layouts.